Last Sunday I ran my 9th marathon, and 3rd consecutive Chicago Marathon. Chicago is by far one of my favorite courses and holds a special place in my heart, which is why I’ve chosen to go back for the past three years. In 2016, I set a 12 minute marathon PR, running a 3:18. I had moved to Chicago a few months prior after graduating college and I was excited to run in a new city that I was lucky to call home. In 2017, I achieved a lifetime goal of mine which was to run a sub 3 hour marathon. I ran a 2:59:12, and although I finished the race dehydrated, nauseous and in so much pain, I have never been happier. I will never forget crossing that finish line. This year’s race was a little different. My training leading up to Chicago was rocky to say the least. 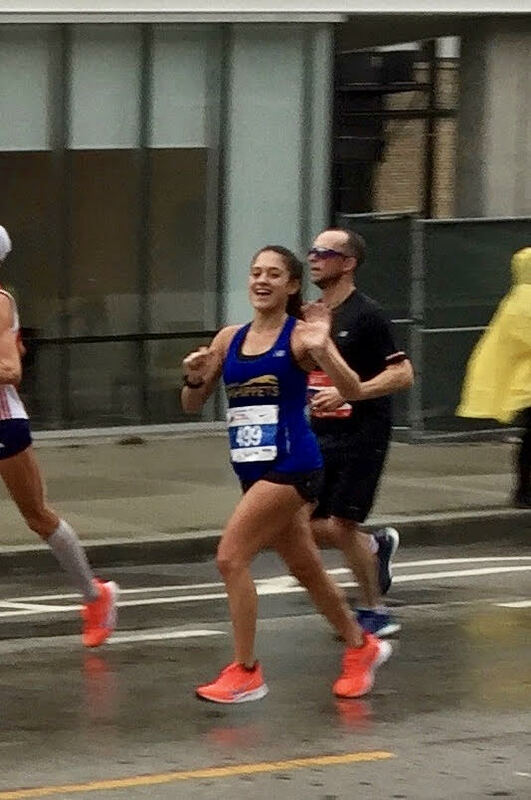 After not achieving a sub 2:55 in Boston in April (I was training to go for a PR), I was disappointed that I didn’t get to prove my fitness, but I was still proud of myself for conquering the horrendous weather and coming out with a 3:02 marathon. After Boston I set my sights on Chicago, but first decided to commit to a “summer of speed” and step out of my comfort zone and run some shorter distance races. Well that didn’t quite turn out as planned. I ran two 10ks in June and both were slower than my goal marathon pace. Yes I was frustrated but I reminded myself that the marathon was the ultimate goal and I had plenty of time to gain fitness. I started specific marathon training in July, which started off with some lackluster workouts. Aside from trying to train at a high level, I moved from Chicago to NYC in July and started a new job just three weeks before the marathon. Now to the actual race… I knew going into Chicago I was not nearly as fit as I was last summer. I had a disappointing race at the Philly Rock n Roll Half, which made me uncertain of what my goal should be for Chicago. Thankfully, I had a few successful long runs and workouts in the weeks leading up to the race that gave me hope. Since moving to NYC, I joined the Dashing Whippets and have met several other runners who I was lucky to do some workouts and long runs with. My new friends and running buddies assured me that I was ready and to just get out there and trust my training. I felt calm during race week instead of my usual anxiety and nerves. I didn’t want to put pressure on myself to hit a certain time and I was just excited to go back to Chicago and get to do what I love on a course that is familiar and comfortable to me. This year I was a part of the American Development Corral. I watched in awe of the elites and sub-elites warm up and chatted with several familiar faces. I wasn’t nervous at all! I was ready to run. The race started and immediately my Garmin watch was off. Due to the tall buildings and tunnels it is almost guaranteed your GPS will not be accurate. Instead of manually splitting my watch I just decided to not even look at it at all. I came through mile 1 in 6:31. I knew I had gone out way too fast and was supposed to follow my coach’s plan for me to start off around 6:50 pace. But, I was having a blast and that felt like the easiest 6:31 mile I’ve ever run in my life. After the first mile I decided not to be stupid and hold myself back a little. Even though it was a rainy and windy day, the crowd support in Chicago was on point. I swear that at every mile I heard people either scream my name, my number, or heard “Go Whippet!”. After running the first 5k in 20:34 (6:37 pace), I knew I was being a little over-ambitious, so I decided to run smart and dial back the pace to around 6:50 effort. I ran into one of my old Chicago training partners, and a fellow NYC runner and was happy to share some miles with them. We all had big goals and it was nice to have company and feed off each other’s energy. I was ticking off the miles smoothly, despite some headwinds and rain that started to pick up. I went through 10k in 41:38 (6:47 pace), the 15k in 1:02:20 (6:40 pace), and 20k in 1:23:23 (6:47 pace). I felt comfortable going through the half marathon in 1:28:02, which is almost the exact time that I ran in the first half of CIM 2017. At CIM I was able to negative split and run a 2:55. As I stepped on that timing mat at 13.1 miles I was ready to get to business. I wanted to cruise along at a 6:50 pace until mile 16, where I planned to pick it up the last 10 miles. However, my body had other plans. Up until around mile 14, my fueling plan was flawless. Every 45 minutes I would take my energy chews followed by a big swig of water. I grabbed 2 cups, one water, one Gatorade, at every station so far. Then mile 15 came and I was hit with a wave of nausea. My vision started to get blurry around mile 17. The thought of taking a gel or an energy chew made me want to dry heave on the side of the road, so I just kept focusing on getting plenty of water. I knew I was slowing down around mile 19. My legs felt fine and I wanted to pick it up, but the rest of my body revolted. I knew a PR was out of the question at that point, but I told myself to just hang on to this pace and I would come in under 3 hours. Then mile 22 came. All of a sudden the 3 hour pace group blew past me. I felt defeated and was unable to respond. I desperately wanted to tuck into that group but they faded away into the distance. It felt so unfair in the moment. Last year I had broken away from the 3 hour pace group around mile 12, and now they were flying past me like I was standing still. But alas, that is the nature of the marathon. You can’t expect anything from it, no matter how hard you work. With four miles to go I knew my pace was slowing significantly. I had the choice to embrace the last few miles and give it all I had or be a sore loser and sulk for the remaining ~30 minutes. I chose to fight for it. Although my last few splits do not look like it, I was working hard. When I hit 40k, I remember my coach telling me to “give it everything you’ve got” for the last 2k. Finally I spotted the sign that said 1 Mile to go. I quickly glanced at my watch for probably the second time in the whole race. I had exactly 6 minutes and 55 seconds to make it to the finish line to finish under 3 hours. I have run that pace so many times in training and I was ready to make it happen. But, 30 seconds later I knew it wasn’t in the cards for me. I don’t remember much from that last mile besides seeing my boyfriend and his mom right before you make the turn to go over the one hill in the entire race. That hill felt more like a mountain. I watched the finish line clock go from 2:59 to 3:00 from only a few blocks away. Admittedly I was upset and humbled, but at the same time I felt proud for making it across another finish line. I had just run a 3:00:41, my 3rd fasted marathon, off not ideal training. I hadn’t set a personal best, but that’s not what the marathon means to me anymore. It means crossing the line knowing you laid it all out there. Like I wrote in one of my Instagram posts, Chicago Marathon 2018 was not my fastest finish time, but the one I’ve learned the most from. This race did not knock me down — it has just made me more fired up for the next one.